To put the figures into perspective, total generation in Q2 was 3194 TWh, so the increase of 51 TWh from wind/solar represents just 1.6%. However, because total generation increased by 245 TWh, demand for coal and gas generation increased even more. In total, wind and solar accounted for 6.6% of generation in the quarter, compared to 5.5% a year ago. 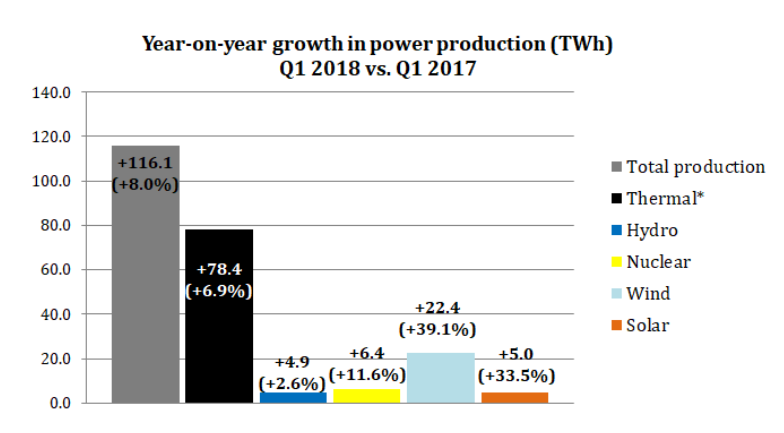 Year-on-year, installed thermal capacity has risen by 4.1%, following an increase of 4.6% in 2017. This certainly shows the insanity of UK decarbonisation policy. Pragmatics renders the Paris Accord irrelevant. Currently the UK doesn’t know the meaning of pragmatics. Trump does; but, if you stir up the swamp you can get some nasty smells. Donald Trump has a healthy pragmatic instinct. He instinctively knows what is sense and what is nonsense. We used to call this “common sense”. However, common sense seems to be in short supply today, especially among the elite. Just in case of any misunderstanding; when I said ‘this idiot’ I meant me! Basically the production of heat which then can be used to produce power. What these birds mean is anybody’s guess. The worst thing for me is that (what passes for) our government is fully aware of the above plus India and South East Asia in general. However it still bleats on about leading the world in fighting climate change. Are our government ministers and advisors just plain stupid? NO They know exactly what they are doing and why. Colin I agree with most of your succinct analysis except for the last question . I do not believe that the ministers and advisors know what they are doing because it seems to be a replay in a different arena of the 2008 financial crisis. I am perhaps too affected by the analogy with that event , having just reread Michael lewis’s book “The Big Short” , but there are disturbing similarities. The events in that book involve the enormous financial bubble created by the bundling of subprime mortgage, (and therefore likely to default), loans into bonds which the regulating agencies (analogous to our Govt energy advisors) rated as triple A or tripe B , ie virtually risk-free and attractive to millions of investors. In fact the regulators did little to check the quality of the loans . A few people realised that the bonds were practically worthless and betted against them (the BIG SHORT). Eventually the bond bubble burst, with the financial disaster we all know. What was critical to that scenario was that the creators of the bonds (like the promoters of renewable energy ) either did not know the risks or would just repeat the mantra- ” only 5% of loans ever default”. Just like “97% of scientists , etc”. As Lewis says , even the CEOs of the finance companies and banks producing the bonds and CDOs did not understand what their traders were promoting as long as it brought in money . Just as our energy ministers have no understanding of the consequence of the promotion of renewables as long as it enables them to say that they are “leading the fight against global warming”. Had proper analysis been done on the financial status of the loans , much of the resultant damage could have been avoided . By analogy , what is needed in the UK is a thorough analysis of the potential risks and advantages of relying entirely upon wind and solar from a technical, engineering and economic viewpoint ( eg as in EROI energy return on energy invested ) without the emotional and political constraints of arguable climate change . But who is capable of performing such analysis?. What about the ore fundamental question…..why fight a natural process. The shear arrogance of the believers is breathtaking.A total lack of mathematical ability and a lack of knowledge of physics helps of course. Is the loss of those skills among the young due to appalling teaching and the promotion of the none science of the Man made global nonsense any coincidence? They both have their origin in far left thinking..
Renewables do nothing but move CO2 around and finally use it as fuel to put the “sequestered” CO2 back in the atmosphere. A pea under the proverbial shell. 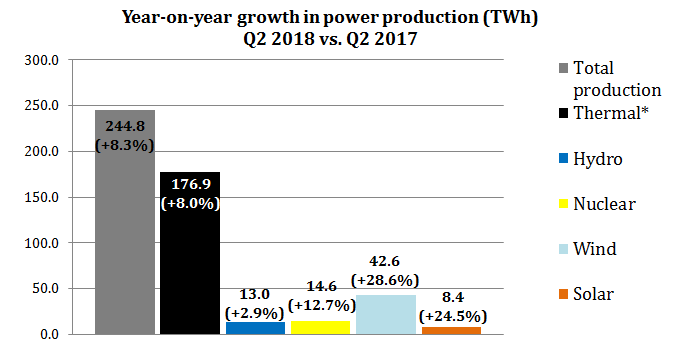 I expect the MSM to announce that China is rapidly de-carbonising, because wind and solar have increased by 28.6% and 24.5% respectively. Let them , indeed encourage them to do so. Most people know that the present CO2 crisis is due to the emissions from China . China is now rapidly decarbonising . Excellent news , jobs a good’un. Lets stop worrying , stop building ugly bird choppers and go to the beach and party whilst the sun is still shining, because it will not be for much longer. There needs to be more, but the world is, thankfully, out of the “crisis” stage for the time being.